Sholom Rabinowitz (Sholom Aleichem, 1859-1916) was the greatest Yiddish author of all time, and a Jewish cultural hero. His writing is comical, satirical, and realistic about the state of poverty and anti-semitism in Europe. Some of his stories were based on his own life, while some were based on the political and religious situation that he witnessed. The legacy of his work has continued to withstand the test of time due to its transformation into the hit Broadway musical Fiddler on the Roof. Rabinowitz was born in Pereyaslav, Poltava, Ukraine on March 2, 1859. The Ukraine was part of Russia at the time. His father worked for the local government and sold timber and grain. His mother owned a general store. He spent most of his childhood living in a shtetl called Voronko, and was raised in the ultra-orthodox Jewish culture as a Chassidic Jew. He attended Jewish schools until high school, when his father sent him to the Russian County School. After graduating from high school, Rabinowitz worked as a tutor for a girl that was a distant cousin. They fell in love, against the wishes of her father. They were married in 1883 and had six children. In addition to his freelance writing, Rabinowitz was appointed to the position of Rabbiner, Crown Rabbi, by the Russian government. This was not the same as a Rabbi that was ordained by way of a theological school, but a clerical position to control the Jewish community. Rabinowitz knew that he wanted to be a writer as a teenager. While in high school, he wrote his first literary work, The Jewish Robinson Crusoe. He has written over 300 short stories, several novels, and fifteen plays. He published work in Hebrew, Russian, and Yiddish. He preferred to write in Yiddish, and is best known for these works. Rabinowitz published work under multiple pseudonyms, including Solomon Bikherfresser (Solomon Bookeater), Baron Pipernoter (Baron Ogre), Terakhs an Eynikl (Terach’s Grandson), and Der Yiddisher Gazlen (The Robber Jew). He first published under the name Sholom Aleichem in 1883 and eventually solely published with this pseudonym. Sholom Aleichem is a formal greeting that means "peace be upon you". There were few serious Yiddish writers. Some Jewish groups criticized the use of Yiddish. Rabinowitz was determined to write in Yiddish in order to make Yiddish writing seem respectable instead of like pulp fiction. His work was serialized in periodicals before it was published in book format. In 1886, he achieved critical acclaim for the short story The Penknife. Rabinowitz was deemed one of the best Yiddish writers of all time, and was compared to Charles Dickens for his realist style, and called "The Yiddish Mark Twain" in America for his comical and satirical style. In 1881, Rabinowitz founded his own Yiddish annual, The Yiddish Public Library (Di Yiddishe Folks Bibliothek). He began to write the short stories about Tevye the Dairyman in 1894 and continued to write about this character until 1916. The situation for Jews in Russia was very grim between 1881 and 1914. Many lost their homes and their lives to the pogroms that targeted the Jewish community. Jews were banned in theater in Russia, but Yiddish theater thrived in Poland. In 1903 a four-volume set of Rabiniowitz’s works were published in Warsaw, and made available in leather and paperback binding. As his writing became more popular he spent a considerable amount of time lecturing in other countries. He adapted his writing for the Yiddish theaters in Poland, as well. The year 1905 was particularly bad, and his family was forced to leave Russia for Austria. He spent time in Switzerland and Germany, as well. In 1906, he was asked to do a lecture tour of the United States. A Jewish committee that included the Jewish newspapers sponsored it. In 1909 his work was first translated to Russian. This was very successful, and he became known as an international literary figure. Eventually his writing was translated into all European languages, and the main Asian languages. In 1914, his family moved to the United States to stay. During this period he was published in Yiddish newspapers in New York. In 1915 his writing was published in The New York World. Some of his writing in English newspapers was published by the name of Solomon Rabniowitz. He died in New York in 1916. Similar authors include Isaac Bashevis Singer, I.L. Peretz, and Mendele Mocher Sefarim. Denman, H. (2007). Sholom Aleichem. In J. Sherman (Ed. ), Dictionary of Literary Biography: Vol. 333. Writers in Yiddish. Detroit: Gale. Gittleman, S. (1974). Sholom Aleichem. The Hague: Mouton. Halberstam-Rubin, A. (1989). 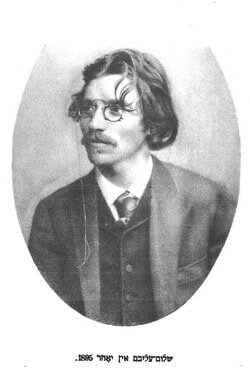 Sholom Aleichem: the writer as social historian. New York: Peter Lang. Halkin, H. (1987). "Introduction". In Sholom Aleichem, Tevye the dairyman and the railroad stories. New York: Schocken Books. This website was created by Rachel Fischer. It was an assignment for LIS 719, History of Children's Literature at Dominican University.